The Jakway Park Bridge in Buchanan County, Iowa is the first bridge constructed with a new prestesssed girder system composed of precast Ultra-High Performance Concrete (UHPC). These girders employ an integral deck to facilitate construction and are referred to as pi-girders for the resemblance of their cross-section to the Greek letter, “π”. 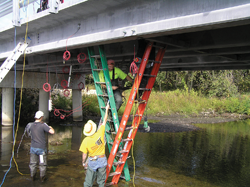 The evolution of the girder geometry, simplifying assumptions, and finite element analysis techniques used in design of the bridge are examined, and the results of laboratory and live load field testing are presented to quantify behavior. The effectiveness of the finite element analysis and structural performance of the bridge, including live load distribution, are evaluated to provide guidance for future designs employing these girders.